by John Walsh, P.A., C.D.E. and Ruth Roberts, M.A. Like Regular, Humalog and Novolog are used to cover meals and snacks. Most meals raise the blood sugar for only 2 to 3 hours afterwards. Once injected, Regular insulin takes 30 minutes to begin working, peaks between 2 and 4 hours and hangs on for 6 to 8 hours, long after the meal stopped raising the blood sugar. Humalog and Novolog, on the other hand, begin working in about 10 minutes, peaks at one to one and a half hours and are gone in about three and a half to four hours. Many people who've tried these faster insulins report that their control is improved and that they feel better. The great advantage of fast insulins are that they match the "action time" for most meals. You can take them as you begin eating, rather than the 30 to 45 minutes prior to eating required of Regular. No longer do you need to accurately anticipate when you (or your young child with diabetes) will begin eating. In addition, Humalog and Novolog leave your body faster so you don't have residual insulin causing low blood sugars in the late afternoon or, even worse, in the middle of the night. For most meals, fast insulins will be lowering the blood sugar at the same time the food is raising it. The rise in the blood sugar seen in the couple of hours after eating is much lower, especially with Novolog, and by the end of three hours the blood sugar is often back to its starting point. With Humalog or Novolog, you're better equipped to prevent spiking blood sugar between meals, while avoiding the lows that result from the combined buildup of Regular and long-acting insulins. The new Lantus insulin is an excellent choice when using these fast insulins to cover meals. The clearly defined action times for the fast insulins makes it easier to correctly adjust meal doses. Humalog and Novolog are also excellent insulins to use to lower high blood sugars. Their faster action means that less time is spent at high blood sugar levels, and there will be less residual insulin triggering low blood sugars later. 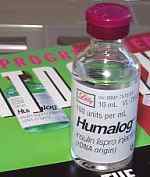 Humalog is produced by Lilly and was first released in the U.S. in 1996, while Novolog is made by Novo Nordisk and was released in 2001. Both insulins offer quicker action time than the original "short-acting" Regular insulin, which first became available in 1921. However, users also report significant differences in activity between each of the three insulins. Let's first look at these differences. Using injections, Humalog, Novolog, and Regular are primarily used to cover meals and snacks, and to lower high blood sugars. Most meals create a rise in the blood sugar for only a short period of time, normally 2 to 3 hours. Regular insulin, available since 1922, takes 30 minutes to start working, peaks at 3 to 4 hours after the injection, and continues lowering blood sugars for 6 to as much as 8 hours. Humalog, on the other hand, begins working in 10 minutes, peaks at one to one and a half hours and is gone in about 3 and1/2 hours. Novolog insulin has an even faster onset of action and peaks in 40 to 75 minutes, which has surprised many when they switched from Humalog to Novolog. The great advantage of the faster insulins is that they can be taken as you begin eating, rather than the 30 to 45 minutes beforehand that is required of Regular. The activity of Humalog and Novolog matches the "action time" for most meals. For mothers of small children and for those on the go, this is a tremendous advantage. Rather than having to lead the unpredictable timing of meals, people can now wait until the meal begins. Those feeling ill can simply wait to cover food they are unsure of keeping down. Kids who are picky eaters can be given their dose after they finish the meal with little loss of control. Humalog and Novolog make a much better match with meals, lowering the blood sugar at the same time food is raising it. Blood sugars measured one to two hours after eating do not spike as high as they do with Regular, and by the end of the third hour the blood sugar can be close to its starting point. The faster action time of these two insulins means the insulin action from the previous meal bolus is gone before the next meal begins. Compared to Regular, both fast insulins offer the advantage of having less insulin activity before going to bed with fewer nighttime reactions. Humalog and Novolog leave your body more quickly, so you don't have residual insulin causing low blood sugars in the middle of the night. You are better equipped to stop spiking between meals and no longer exposed to the overlapping buildup of Regular boluses. However, for those paying for their own insulin, price shock can be significant. Humalog and Novolog are typically priced at about $60 a bottle, while Regular can be obtained as low as $18 a bottle. A couple of major differences are being reported by users between Novolog and Humalog. Especially among pumpers who switch from Humalog to Novolog, reports have surfaced that Novolog appears to be both stronger and quicker than Humalog, and doses have to be cut in order to prevent hypoglycemia. Dose reductions are often in the 10% range, and it may be wise to reduce doses right away to prevent unwanted lows. If, instead, blood sugars rise, doses can always be raised again. Novolog also starts working faster than Humalog. Although no direct comparison of Novolog and Humalog has been reported, one research study found that in normal individuals, Novolog reaches peak activity at 52 minutes, compared to 145 minutes (2 hours and 25 minutes) for Regular insulin. Humalog peaks at about 75 minutes (Eur J Clin Pharmacol 1999 May;55(3):199-203). Both pumpers and injectors may note lower post-meal readings due to the faster onset of action. The clearly defined action times of the fast insulin makes it easier to troubleshoot problems. For information on how to determine the number of carbs covered by each unit, see the 500 Rule in the Pocket Pancreas. Humalog and Novolog are also excellent for lowering high blood sugars with less time spent at high blood sugar levels, and less residual insulin left to trigger low blood sugars later. For information on how to safely lower highs, see the 1800 Rule, also in the Pocket Pancreas. Test often. Test your blood sugar often to determine how fast insulins work best for you. As you start using Humalog or Novolog, it is wise to test before eating, 2 hours after eating, and anytime you experience unusual symptoms. Test often and use special caution when lowering high blood sugars. Be especially alert for lows at one or two hours after a meal and at other unexpected times. Cover food differently. The great advantage of faster insulins is their convenience. Although a 10 to 20 minute lead time is ideal, doses and boluses can be taken with the first bite of food with very good post meal control. Of course, their quick action means that you must not delay eating! If the premeal blood sugar is high and eating is delayed to allow the blood sugar to drop, the food must be eaten at the time planned to avoid a low blood sugar. Foods that have a high glycemic index and raise the blood sugar quickly, like cold cereals or a scone for breakfast, are easier to cover with fast insulins. On the other hand, when low glycemic carbohydrates like pasta al dente or a bean burrito are eaten, the blood sugar may go low before these foods can completely digest. For occasional foods with a low GI, doses or boluses can be split. Take half before the meal and the second half an hour or two after eating. Pumps also have dual or extended boluses to stretch out insulin action. Another option is to use an injection of Regular to match slow carbohydrates. Meals with a high fat content may also occasionally need similar coverage. If your blood sugar is low or on the edge of low at mealtime, eat the meal and take a slightly reduced dose of fast insulin afterwards. Treat lows differently. Because of their faster action, fast carbs are recommended when you need to treat low blood sugars. Glucose tabs, honey, or candies with dextrose, like Sweet Tarts, work best. Low blood sugars usually occur within 3 to 3 and 1/2 hours. Obviously, if a low blood sugar occurs one or two hours after a dose or bolus, more carbohydrate will be needed to raise the reading back to normal than if the low happens three or four hours after the bolus. At three hours, a small amount of carbohydrate (10 to 20 grams) is usually all that's needed to remedy the situation. Another great benefit of fast insulins is that fewer lows are experienced during the night. When people used Regular to cover dinner, they often needed a bedtime snack to avoid a low during the night. In contrast, Humalog and Novolog can be used at dinner with little need for a bedtime snack if the nighttime insulin is correctly set. Several research studies previously reported that boluses remain the same when people switched from Regular to Humalog. However, there were several reasons to be alert for changes that may be needed. When switching from Regular or Humalog to Novolog, however, it appears wise to reduce basals and boluses about 10% at the time the switch is made. With either fast insulin, but especially with Novolog, less insulin is needed to cover the same number of grams of carbohydrate. Compared to Regular, the shorter action time seen with boluses of fast insulins often require a higher daytime basal rate. With Humalog and Novolog, the basal rate usually makes up 50% to 60% of the total daily insulin dose. In research on Humalog's biologic activity, two of six studies found that Humalog was as much as 10% more active than Regular in lowering blood sugars, while the other four found its activity was identical to Regular. Be alert if a unit of Humalog seems to go farther than a unit of Regular. Any change in insulin doses should only be attempted after discussing them thoroughly with your physician. Many pumpers using Humalog report they need slightly less insulin through the day. Some find boluses may need to be reduced as much as 10 to 25%. Basal rate amounts generally don't change, although some find they need to raise the basal rate in the late evening and early nighttime hours because they used to rely on Regular's long action to work into the nighttime hours. With Humalog's greater speed, basal rate changes are made closer to the actual time they are needed. For instance, on Regular, if the basal rate is raised at 2 a.m. to offset a Dawn Phenomenon, raising the basal rate might be delayed until 3 a.m. on Humalog. With Novolog, many pumpers report they need to delay any rise in basal rates forward by an hour or two to prevent lows. For example, if the basal rate is normally raised at 3 am on Humalog, it would be delayed until 4 am or 5 am on Novolog. For safety's sake, do not use the suspend feature with Humalog for exercise or low blood sugars. If you forget to take it out of suspend, you can quickly end up with high blood sugars. Because of its short action time, blood sugars typically begin to rise after 60 to 90 minutes after the insulin is suspended, unless a bolus was taken recently. Another reason to never use suspend is that insulin which is static in the infusion line encourages clogging. Always take Humalog by injection at the FIRST high blood sugar reading over 300 mg/dl (17 mmol). If any delivery problem occurs with Humalog in your pump, blood sugars can start to rise within 60 to 90 minutes, and ketoacidosis can begin in 4 to 5 hours. If a SECOND reading taken 90 to 120 minutes later is still over 300 mg/dl, take Humalog by injection and change out the reservoir and infusion set. Humalog gives better readings 1 to 2 hours after meals. Usually Humalog was given at the start of a meal, but even when taken 15 minutes after a meal Humalog gives better postmeal readings compared to Regular taken 40 minutes before a meal. The HbA1c is lowered by an average of 0.5%. Humalog improves quality of life. Other results in individual studies were also positive. In one study, two people who had hypoglycemia unawareness regained warning symptoms of a low blood sugar. In a study of adolescents, incidents of nighttime hypoglycemia decreased. The subjects in most of the research studies above were Type 1's on long term intensive management who had good control with HbA1c's in the 7's or 8's before using Humalog in the study. But one study followed people with "brittle diabetes" with erratic blood sugars and high HbA1c's. On switching to Humalog from Regular, their diabetes improved in all four areas listed above. Another study using people with Type 2 diabetes also reported these improvements and the subjects had no weight gain. Keep refrigerated or cooled at all times, but no cooler than 36 degrees Fahrenheit. If you have an unexpected high, don't automatically assume it's your fault! Some people have noticed unexpected high blood sugars with Humalog and report that Humalog may deteriorate faster in hot weather than Regular or Novolog. Control problems can certainly occur for other reasons such as incorrect basals and boluses that do not match the need for insulin. But Humalog appears to be less stable and more likely to lose activity, especially when exposed to heat or excess cold. Test often and if your insulin does not appear to be having its expected effect, check for particles in the bottle and open a new bottle. Though rare, when Humalog does go bad, it does so quickly. Blood sugars may be fine one day and high the next. If blood sugars are unexpectedly high for any reason, check for particles in the bottle. These are usually seen as one or two large floaters, or as several small crystals in solution or on the sides of the bottle. Always start a new bottle if you have any doubts. In summary, the overwhelming majority of shooters and pumpers have gladly welcomed the newer fast insulins. Most have also been impressed by improvements in their control, and in the convenience of taking their insulin right before they eat. Fewer lows at night and improved HbA1c reports are a few of the benefits pumpers have experienced, and most report they actually feel better on fast insulins. For additional information on Humalog and intensive management, carbohydrate counting, glycemic index, proper insulin doses, or exercise, get Pumping Insulin and the Pocket Pancreas by J Walsh PA and R Roberts MA, or Using Insulin by J Walsh PA, R Roberts MA, C Varma MD and T Bailey MD.